If you need a rugged, robust, heavy hauler for business or recreation, feast your eyes on the 2016 Ram 3500. At Premier Chrysler Jeep Dodge Ram, serving the surrounding cities of Metairie, Kenner, and Slidell, we have just the truck you are looking for. If you live near New Orleans and are in need of a brand new truck, come on down to our Chrysler Dodge Jeep Ram showroom and let our well-informed staff help you find the Ram 3500 pickup truck of your dreams! With strong powertrains and exceptional towing abilities, there is no job that is too tough for the 2016 Ram 3500 pickup. When it comes to hefty haulers, there is no contest between the 2016 Ram 3500 and its rivals. HereÂ's how the 2016 Ram 3500 compares to the Ford F-350 Super Duty. Given the tremendous variations in trims, models, box sizes, and the like, it seems most appropriate to do an apples-to-apples comparison of the base model 2016 Ram 3500 and the Ford F-350. The base Ram 3500 Tradesman comes with a starting price of $32,285 while the F-350 XL starts at $33,280 -- almost $1000 more than the Ram 3500. Standard features include 17-inch steel wheels, a 40/20/40 split bench seat and storage, air conditioning, an electronic vehicle information center, a six-speaker audio system and a media hub. The F-350 comes with similar standard features but only a two-speaker audio system and a higher price tag. When you need a big truck because you are going to be hauling things around, you want to make sure that your truckÂ's towing capability is at the top of its class. And it is with the 2016 Ram 3500. On the 2016 Ram 3500 Tradesman and SLT models, you will get a maximum 31,210 pounds of towing capacity. 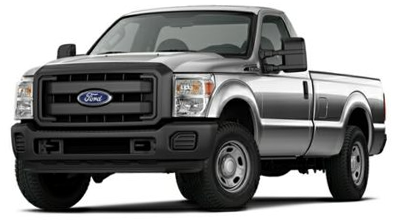 The F-350 tops out its conventional towing capacity at just 19,000 pounds. That's nearly 3 tons less of weight that you can haul behind you. The clear winner here in the towing battle is the 2016 Ram 3500. While both the Ram 3500 and Ford F-350 are excellent examples of what a full-size utility pickup should be, they are not built the same when it comes to engine power. 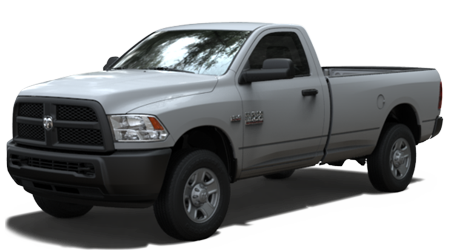 The Ram 3500 comes with a choice of three engines; a 5.7-liter V8 HEMI VVT with 383 horsepower, a 6.4-liter HEMI V8 with 410 horsepower, or a 6.7L Cummins inline six-cylinder Turbo Diesel engine with 900 pound-feet of torque. The F-350 comes with two engine options; a 6.2-liter V8 with 385 horsepower or a 6.7-liter Power Stroke V8 Turbo Diesel engine with 440 horsepower. The 2016 Ram 3500 pickup offers more engine options to allow shoppers more versatility as well as more powerful engines and an unmatched torque rating from its Cummins turbo diesel I6. The 2016 Ram 3500 is the truck to beat, but the Ford F-350 canÂ't beat it! If you are on the trail of a hefty, sturdy, and hard-working pickup truck that can tow and haul just about anything you would ever need to tow or haul, then head to Premier Chrysler Jeep Dodge Ram and check out the Ram 3500. This exceptional pickup truck is the answer to all of your heavy duty driving needs and you can find it right here at our New Orleans Chrysler Dodge Jeep Ram dealership. We are located at 13000 I-10 Service Rd in New Orleans and serve shoppers from all over Metairie, Kenner, and Slidell.